Hospital- oh no! - Super Inky! Violet and I had this picture taken last week. Since we're homeschooled, we don't have school photos taken. 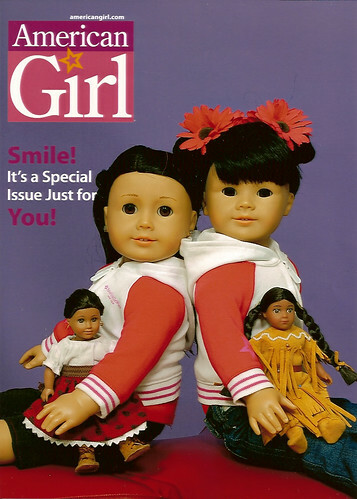 Instead, we went to American Girl Place and had our portrait done with our dolls! It was so much fun. We both wore our AGP hoodies and carried an American Girl doll. I already miss Violetka so much. I'm off an a new adventure- guess where I'm blogging from this time? The hospital! My red Keens gave me a really itchy, painful, red rash. I had to come to the Doll Hospital in Wisconsin to get seen by a doctor. I hope everything goes well! Think of me, okay? I should be home in a few weeks. I always like that photo of you and Violet. I think it would be fun to have a portrait done there! I hope you don't get anymore painful rashes. I hope you don't get any more rashes! What did the docs do?